The mission of the CSUN Department of Social work is to prepare professional social workers for anti-oppressive, strengths-based practice with individuals, families and communities in the urban setting. Our mission reflects both the universal values of social work “to promote the well-being of individuals, families and communities” while reflecting the unique context of California State University Northridge—an urban setting in the heart of the San Fernando Valley, Los Angeles County. We offer a single concentration: advanced generalist social work practice. This focus offers students the opportunity to learn strategies for working in any urban environment at the micro (individual/family), mezzo (group/community) and macro (policy/societal) levels. The mission of the California State University, Department of Social Work is to prepare professional social workers to be anti-oppressive, socially just agents of change by promoting well-being in urban settings. As an advanced generalist program with a focus on urban communities, the Department will teach and create collaborative learning experiences with students. Urban settings describe communities with densely populated areas and a vast array of subcultures. Utilizing a lens that espouses an intersectional, trauma-informed collaborative perspective, the Department celebrates a strengths-based inclusive identity, emphasized by the shared experiences of community, culture, and location. Examine and apply an intersectionality, power, and privilege lens to address social, political, and systemic change. Empower and be relevant to the diverse needs of the multi-national, multi-ethnic, multi-cultural San Fernando Valley and its surrounding communities. Advocate for an equitable and socially just society. Enhance critical consciousness through research, practice, and trauma-informed knowledge, values, and skills. Following the school shooting in Parkland, Florida in February, 2018, Dr. Willner conducted a national survey about the opinions America’s educators hold about being armed in their classrooms. The study is an important first step in gathering data to be used in decision making about how to best protect our students and schools. Click on the link above to read the paper (.pdf). Join us in Oakland, California for 2 days of Continuing Education focused on Social Work Practice in the Latinx Community. Registration is open for this conference. 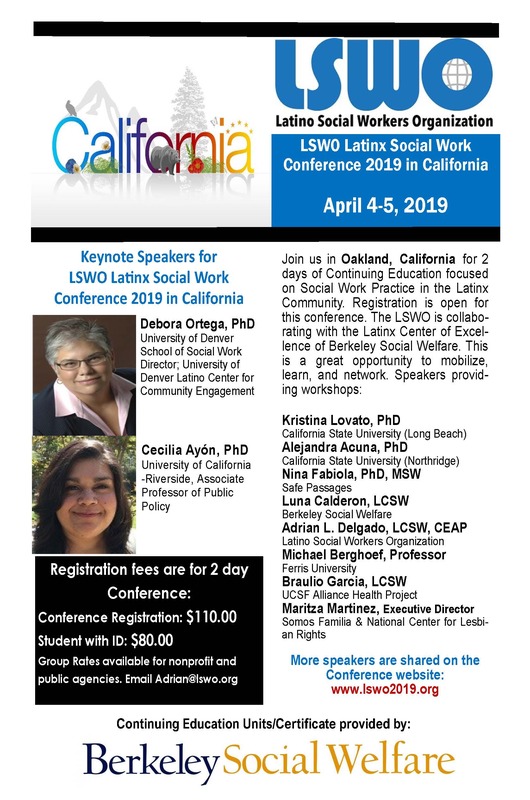 The LSWO is collabo-rating with the Latinx Center of Excel-lence of Berkeley Social Welfare. This is a great opportunity to mobilize, learn, and network. *Please check your spam folder for the Informational Email, as CSUN email's are occasionally unrecognized.